Do you still rememeber me? Just want to say that I am still alive and would like to make some new wallpapers in my free time. As usual the trigger to make new wallpaper is recently watched anime/manga. So this time I read Tokyo Ghoul, so here it is, Kaneki wallpaper. Plus song inspiration Linkin Park - Figure.09, quite fitting I would say. And side note, I have updated my personal website (Karafuru Sekai) to 5th version! While I am updating my content there I will change some old wallpapers, if I still have .psd files. The old version is avaiable there, maybe some like old version better. And here is my shiny, you can find other resolutions there. Glad to know you still have the aim to make walls. 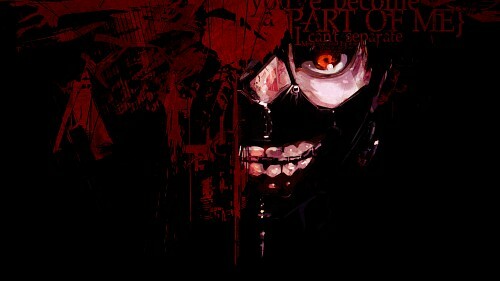 And yay, Tokyo Ghoul! I'm watching it too, that's pretty nice. As a LP fan I have to agree, this song is really fitting for Kaneki, haha.